"In a town where Amish and Englisch mingle every day, a grisly murder leads to mutual suspicion. Can Amber and Hannah find the killer before fear unravels the community . . . or he strikes again? Another murder has hit The Village in Middlebury, VA and this time, the victim is a young Amishman. Shot with an arrow and crossbow, Owen Esch had recently returned to Middlebury and coincidentally, so had Jesse’s older brother Andrew. This vile and sudden murder has rocked this tightly knit community to its core as it brings out Federal investigators, a possible cult, and of course our returning sleuths, Amber and Hannah. 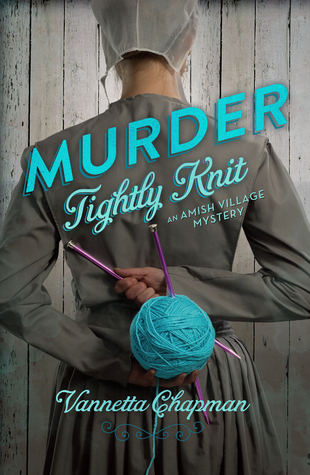 In a story of God’s will, keeping faith and loving thy neighbor, Murder Tightly Knit is a wonderful thrill of a cozy mystery. Murder Tightly Knit gives us the point of view of multiple characters, again, just like Murder Simply Brewed. Something that I really liked about this particular book is that we also get the point of view of the killer as well, but don’t think that means it will be easier to figure out who dunnit. The way the author sets up the mystery gives the reader no chance of figuring out the killer, as the essential clues and character introduction aren’t made until late in the book. In this mystery, faith is a particular strong issue. Jesse’s faith in his brother Andrew is like a roller coaster because he’s questioning his brother’s motives for coming back, and if he even wants him to stay. This waning faith in the prodigal son is basis for the reader to question if Andrew is responsible for Owen’s death, just as Jesse was wondering. We are also introduced to Mary, the knitting shop manager, in this story. I feel like her only purpose in the story was to give reason for Amber and Hannah to enter the investigation of Owen’s death, because she didn’t seem all that necessary otherwise... at least to me. Andrew’s character could’ve been enough to involve them in the case. I loved how the case eventually brought Hannah and Jesse together, as they learned to confide in one another and was able to go through turmoil to test their faith and love in one another. I also liked how Tate was gone through most of the story, because otherwise I feel like he would’ve held Amber back in this case. In all, I believe Murder Tightly Knit is a lovely fast read mystery that will leave you feeling a part of the wonderful community of Middlebury. If you love amish fiction, and are a fan of mysteries, this series is done wonderfully and is definitely for you! I very much look forward to reading more from this series, and indeed this author as well.